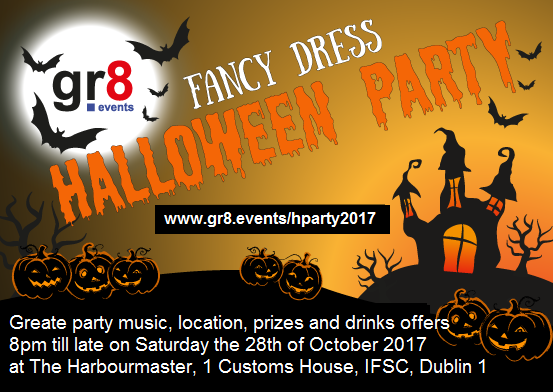 Come and celebrate Halloween with us in fancy dress 🙂 we will be on the ground floor of the Harbor Master (fancy dress is optional). • Early bird tickets are available at *5 euro per/person – for a limited time – Get yours now to avoid disappointment. Online ticket sales end at 5pm on 28/10/16 there will be 100 tickets reserved at the doors for attendees on the night. DJ playing the best party and Halloween music. Offers at the bar – 5 euro or less for selected (beer, shorts + mixer). RSVP and get your ticket now as places are limited. It is particularly important that you RSVP if you will be attending. This event is listed in a few places, so there will be many more people than you can see RSVPs for here. The plus number associated to the organiser is a small percentage of the associated facebook group that will be attending.